Season 2, Ep 26: Pink Floyd, poop trains and Bristol baby! WARNING: This podcast contains strong language and mature content. 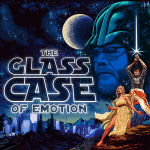 On this episode of the Glass Case of Emotion, Ryan, Chuck and Kim delve into the world of Pink Floyd and The Wizard of Oz , poop trains in the middle of Alabama and Bristol Baby!